TORMENT is good, crazy horror with brains. Its a debut novel from my good friend Jeremy Bishop. And right now it’s only $2.99 on the KINDLE and NOOK. Check out the cover and trailer below or visit the very cool looking website and check out the story details. You can take a test there, too and find out which creature in the world of TORMENT you are. Awesome. 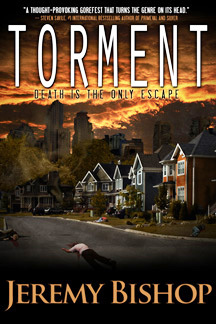 If you enjoy my books, you’re going to love TORMENT.